NTSB: Uber Self-Driving Car Had Disabled Emergency Brake System Before Fatal Crash : The Two-Way The National Transportation Safety Board's preliminary report said that sensors saw the victim. But Uber says it's the driver, not its system, that was supposed to intervene to avoid the collision. A vehicle drives by the spot where an Uber self-driving vehicle struck and killed a pedestrian earlier this year in Tempe, Ariz. The National Transportation Safety Board released a preliminary report Thursday on the collision. The Uber self-driving vehicle that struck and killed a pedestrian two months ago in Tempe, Ariz., took note of the victim with its sensors, but its software did not engage the car's brakes to prevent the collision, according to a preliminary report released Thursday by the National Transportation Safety Board. Investigators with the federal agency determined that the car's detection systems, including radar and laser instruments, observed a woman walking her bicycle across the road roughly six seconds before impact — likely enough time, in other words, for a vehicle driving 43 mph to brake and avoid fatally injuring the woman. But it did not immediately identify the woman as a human pedestrian. Instead, the agency said, "as the vehicle and pedestrian paths converged, the self-driving system software classified the pedestrian as an unknown object, as a vehicle, and then as a bicycle with varying expectations of future travel path." It was not until 1.3 seconds before impact that the car's self-driving system "determined that an emergency braking maneuver was needed to mitigate a collision," NTSB explained. Investigators added that the driver, who was alone in the car and survived without injuries, intervened less than a second before the crash and only began to brake after the impact. As to why the software did not engage the brakes on its own, NTSB noted that this passive approach is actually an intentional part of the design. The agency explained that the vehicle, a modified 2017 Volvo XC90, comes "factory equipped" with automatic emergency braking — but that Uber's system disables this function and others when it's in use. "According to Uber," the agency said, "emergency braking maneuvers are not enabled while the vehicle is under computer control, to reduce the potential for erratic vehicle behavior. The vehicle operator is relied on to intervene and take action. The system is not designed to alert the operator." The agency noted that "all aspects of the self-driving system were operating normally at the time of the crash, and that there were no faults or diagnostic messages." 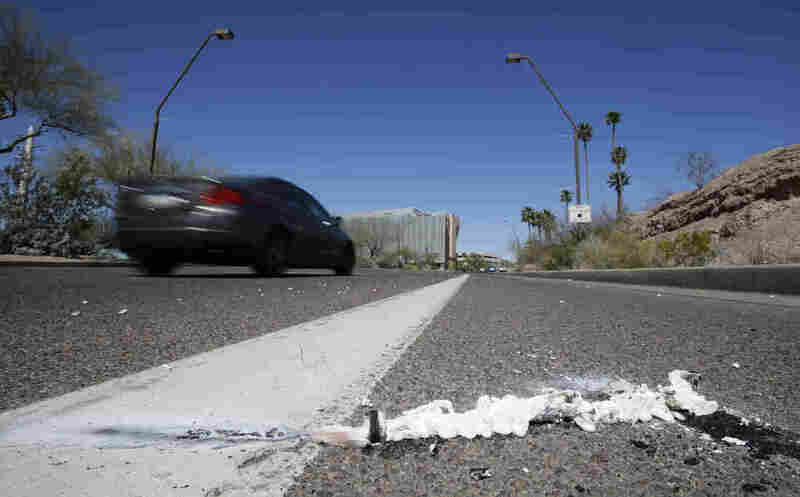 As NPR's Scott Neuman reported in March, dashcam footage released by Tempe police showed the safety driver's gaze apparently "divided between something inside the car and the road," with eyes diverted for several seconds before finally looking up again just moments before impact. "In a postcrash interview with NTSB investigators, the vehicle operator stated that she had been monitoring the self-driving system interface," the report said. "The operator further stated that although her personal and business phones were in the vehicle, neither was in use until after the crash, when she called 911." The pedestrian, for her part, had been dressed in dark clothing and crossing the road in a section not directly illuminated by streetlights, hundreds of feet from the nearest crosswalk, according to investigators. "Toxicology test results for the pedestrian were positive for methamphetamine and marijuana," they added. NTSB asserted several times that its probe remains ongoing, and that the preliminary report did not set out to find probable cause for the fatal collision. The agency said that investigators are still working on determining that cause, and that it intends to issue "safety recommendations to prevent similar crashes."